This Eagle Creek Review is based on our personal experience of our Eagle Creek Pack It products, which we have used frequently and are very pleased with. Eagle Creek luggage and packing organization solutions are designed to last you a lifetime and to make your life easier when travelling. Their products help you to stay organized, allow you to fit more into your bag and keep our belongings more secure. The Eagle Creek products are durable, lightweight, easy to use and they come with lifetime warranty. Based on our personal experience we are comfortable recommending the Eagle Creek brand. Are You Struggling With Fitting Everything In Your Bag? Can You Do With More Space But Less Wrinkles? Then the Eagle Creek luggage might be what you are looking for. Their packing organization solution system helps keeping your bag organized and your clothes as wrinkle free as possible. The packing cubes ensure better use of the available space in your bags. They compress the content, allowing you to fit more into your bag. Because of their shape, there are fewer awkward empty gaps, i.e. which can be difficult to fill. Top Travel Tips article on Packing Cubes details the benefits of packing cubes and outlines the different types of Eagle Creek packing solution products available. This Eagle Creek review is based on our personal experience with our Eagle Creek Pack It system, which we have used frequently on our travels. We are very pleased with our experience and therefore very comfortable with recommending the Eagle Creek brand for packing solutions. We own three packing cubes in three different colors. We bought them prior to going on our year long around the world trip in 2006. We have used them on all our travels since, as well as at home. We do use our cubes in more than one way, i.e. depending on how we are travelling. We like to use them to keep our loose items in order, e.g. one cube for cables and gadgets, one for underwear and socks, one for t-shirts or used items, etc. When we are moving between places, e.g. when driving around a country, staying couple of nights in each place, then we often use them to avoid unpacking the whole bag. We just put couple of days of outfits into a packing cube and just remove it from the bag, i.e. live right out of the cube. This is very convenient and time saving. The different colors means we can dig in and take out the relevant packing cube when we need it. We have also been using them as core object after we learned to use the bundle wrapping packing method. Our cubes are also in use when we are at home. They fit nicely into drawers and cupboard and are great to store various loose items, like underwear and socks. We really like our Eagle Creek packing cubes. They are good quality - they all look like new despite frequent use. They fit very well into any bag. The mesh top allows you to see what is inside each cube, as well as making them breathable. “ Packing cubes are like an iPad, do I really need them? No. Packing folders help to keep shirts, trousers, sweaters and jackets flat and as free of wrinkles as possible. We own one and we use it when appropriate, i.e. on business trips and when travelling with clothes that are more prone to wrinkle. 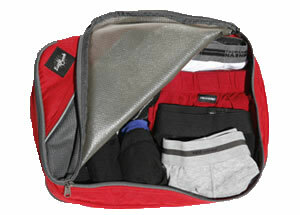 We use it less then our packing cubes but it is great for business trips. The shirts really look better after we started using the packing folder. The folding instruction board is very helpful, making it easy to pack the shirts to minimize wrinkles. Those that travel mainly with casual wear will find less use for the packing folder than the packing cubes. They are however great for business travelers and those travelling with more formal wear, e.g. when going on a romantic city break or on a cruise. It is vital to be able to store toiletries safely away from the rest of your luggage, you do not want any toiletries spills on your clothes or gadgets. We have been using our Eagle Creek travel cosmetic bag since 2006 and we are very pleased with it. It is stylish and very functional. It depends how much toiletries people take with them when travelling. We can usually fit all toiletries for two in it, though sometimes bit tight for longer journeys. If only one of us is travelling, then there is plenty of space for our toiletry needs. It has number of compartments and zipped pockets, which are very useful to keep loose items separate. You can hang the bag up which is often handy. The material is water resistant which is useful if (or when in our case), you put it accidently down on a wet surface. Finally yet importantly, it is easy to clean and it fits nicely into any bag. We are happy with our Eagle Creek travel cosmetic bag and always use it, despite owning couple of other travel toiletry bags. Why do we always choose the Eagle Creek one? Guess it is due to practicality. We can fit a lot into this travel cosmetic bag and it fits nicely into any bag. The zipped pockets are great and the ease of clean is highly appreciated as toiletries can make mess. Eagle Creek offers many more products than we own and have tried out. However, based on our personal experience with our Eagle Creek Pack It products we at Top Travel Tips are comfortable recommending the whole Eagle Creek brand, especially their Pack-It products. When preparing this Eagle Creek review the words that came first to our mind where durable, practical, lightweight, comfortable, secure, organized and stylish. In our opinion, Eagle Creek products are good value for money. 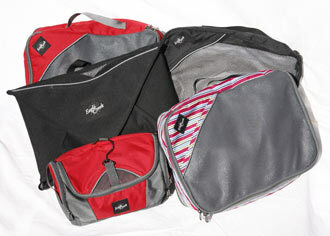 Eagle Creek packing products are great solution for all travellers that like to stay organised when travelling. They are especially useful for those travelling with backpacks or duffels (easy to carry but challenging to organise) or that live out of their suitcase while on the road. Eagle Creek does not sell directly on-line but Amazon is one of their recommended online retailers. Amazon offers the greatest range of Eagle Creek products. We at Top Travel Tips have found them to offer very competitive prices. Don't forget to check their customer's Eagle Creek reviews... almost all seem to agree with our Eagle Creek review conclusions. Ps. there are more than one way to pack your bags, Top Travel Tips explains in detail the three most popular Packing Luggage Methods.